Workshop participants. Photo by Christine Mladic Janney. The city of Cusco, Peru , was once at the center of the Incan Empire . Today, thousands of tourists flock each day to catch a glimpse of what remains of that history in the stone walls in the city center, as well as at ancient temples  and archeological sites . Physical monuments aren't the only bridge the city has to its past. Quechua was spoken back then, and is still alive and well today. Wander the streets of Cusco or the surrounding communities and you'll hear residents proudly chatting away in the ancient language, which is now protected by modern public policies. 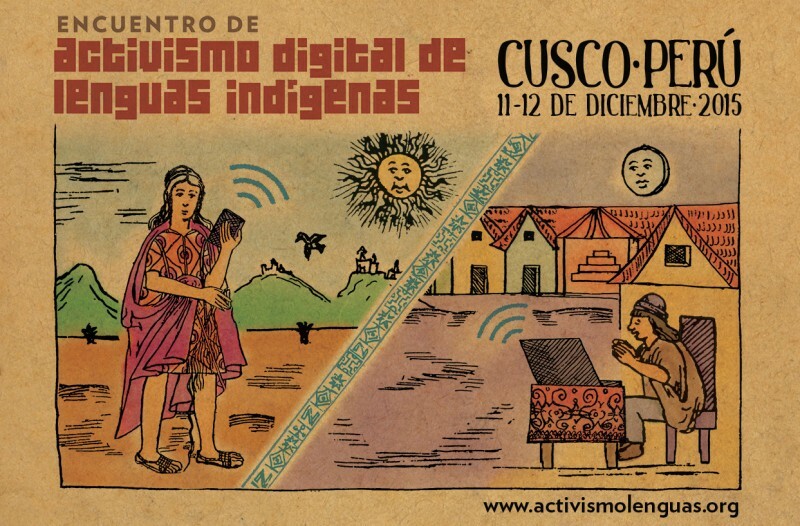 This backdrop of linguistic pride and promotion made Cusco an ideal site for the latest installment of the Gatherings of Indigenous Language Digital Activism in Latin America. Held over the course of two days on December 11-12, 2015, this event aimed to forge connections between young indigenous activists using digital media to revitalize their native language. It was the third such gathering, with earlier versions held in Oaxaca, Mexico  and Bogotá, Colombia . The event was co-organized by Global Voices through its Rising Voices  initiative. Other co-organizers and partners including the Bartolome de las Casas Center  (CBC), the Peruvian Ministry of Culture (Indigenous Language Directorate  and Cusco Cultural Directorate ), the Living Tongues Institute, and Mozilla Nativo. The event took place at La Casa Campesina , a conference center of the CBC located in the historical center of Cusco. The gathering was also made possible in part through the support of Hivos . “Gathering of Indigenous Language Digital Activism”. Created by Rodrigo Carús. 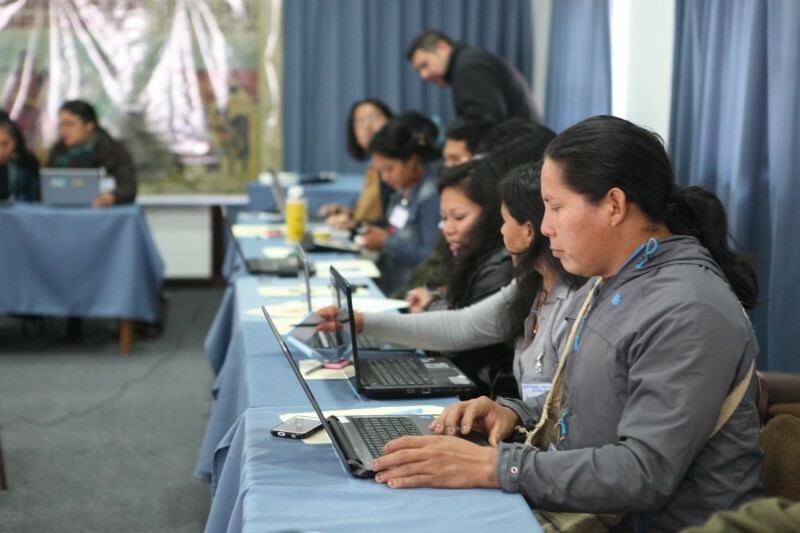 In mid-October, organizers published an open call inviting interested individuals from Peru already working to revitalize their native language through Internet-based tools to apply. Participants were selected with geographic and linguistic diversity in mind; a commitment to sharing what they would learn with their own communities was also important. Unsurprisingly, Quechua applicants were the most represented among the applicant pool, although interest poured in from different regions in the country, including the Amazon, the Andes, and the Altiplano. Applicants demonstrated the commitment through their community-based projects, including a digital television show, audio podcasting, poetry, oral traditions documentation, and social media. Following a thorough review, the selection committee chose 25 people to take part in the two-day event. The event included a mix of group discussions, project presentations, and hands-on workshops, similar to the format of the previous two gatherings. Organizers led the group discussions by introducing a topic, such as linguistic or technical challenges in using native languages on the Web, community rights when sharing information online, and partnerships public and grassroots organizations to increase the impact of activism. Following a short presentation, participants shared their ideas and own personal experiences with the topic in a conversation-like setting. Participants also introduced their own personal projects and gathered feedback from their colleagues. 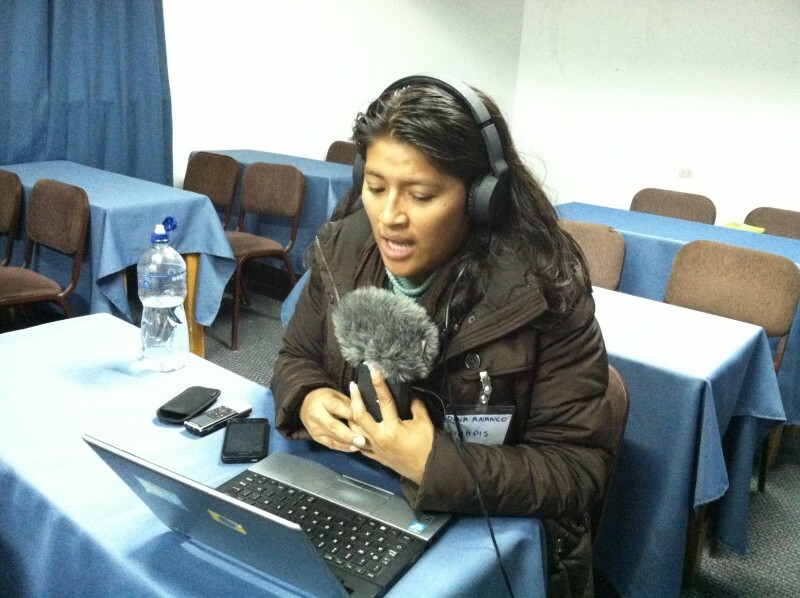 These included audio podcast interviews in Quechua, an oral storytelling documentation project in the Shipibo-Konibo language, and an activity created GIFs in many of Peru's languages. Mentors also shared their own projects, such as the Talking Dictionaries  from the Living Tongues Institute, the Languages Sound Map  from the Ministry of Culture, Mozilla's localization efforts , and the Rimasun Quechua Podcasts  from New York University, among others. Audio podcasting workshop. Photo by Christine Mladic Janney. When it came to interactive workshops, participants chose one workshop to spend approximately six hours in over the course of the two days, instead of several 90-minute workshops like in past gatherings. This change allowed attendees to delve deeper into a specific digital tool and be able to create a concrete product at the end of the event. 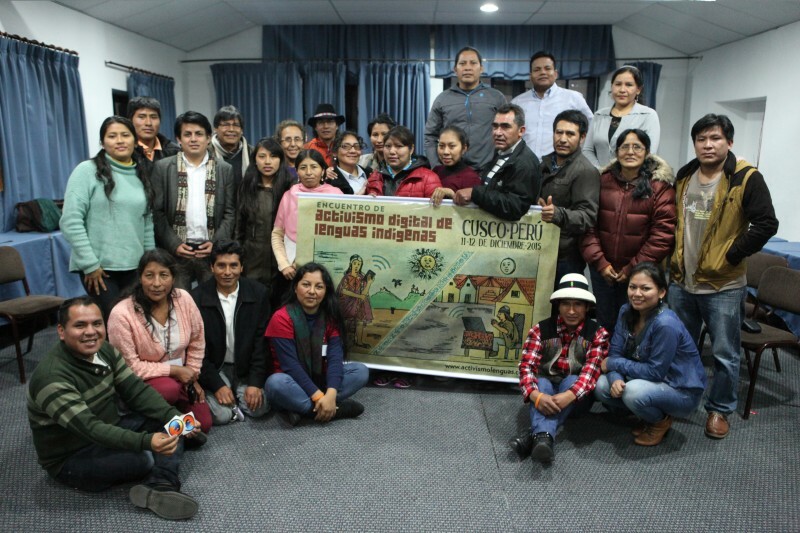 A public forum co-organized by Global Voices and the CBC called “Internet in My Language — Experiences of Peruvian Indigenous Language Digital Activists ” was held on the evening of the first day. Free and open to the public, the forum was an opportunity for workshop participants to interact with the general public to help raise awareness about the topic. With two days of networking, skills-building, and inspiration drawn from their fellow participants, the 25 attendees reflected upon their recent experience  during the closing session. Many said they were motivated to do more for their language and culture with the opportunities provided by technology. Participants also indicated that they wanted to stay in touch through virtual platforms, such as through the gatherings private and public Facebook groups . Video interviews with the participants — conducted in Spanish and in their native language — are gradually being shared on ActivismoLenguas.org , a portal launched by Rising Voices in 2015 to feature indigenous language digital activism projects across Latin America. The interviews were filmed during the digital video workshop led by Ch'aska Rojas-Böttger. These gatherings demonstrate that innovative work is taking place on a grassroots level, but there is still need for technical, linguistic, and community support. The challenge remains finding meaningful ways to connect these young indigenous language digital activists. Building a network for them is a step in the right direction. Global Voices hopes to continue to co-organize more workshops in 2016 by seeking partnerships with local organizations that share this mission of deepening the impact of these young digital activists's work.